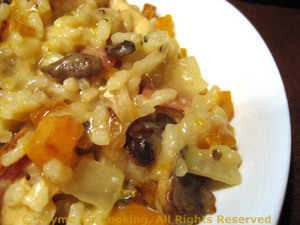 Risotto with Mushrooms, Butternut Squash, Thyme for Cooking seasonal gourmet. As always, the end result should be creamy, smooth, almost soup-like, never stiff. The squash gives a bit of sweetness to the risotto and the bacon a bit of smoke. Cut the bacon into matchsticks and chicken into small pieces. Cut butternut squash into small pieces. Heat olive oil in nonstick skillet. Add bacon and sauté until crisp, remove. Add chicken and sauté until cooked through, remove. Return mushrooms, bacon, chicken to skillet, cover and keep warm until needed.